I wake up again at 4.30 on the comfy sleeping sofa at my sister’s house. Quickly I range everything, and I leave the house. My sister asked me, if I have a kind of lamp as on this time nobody would expect a hiker. Yes, I have, not one but two. Only problem is, that it is already daylight. Old cast iron signs around Ilanz. Unfortunately the case of my smartphone was dirty and so all pics turned a little bit blurry. So again, it’s kind of a run down to the railway station but I make it fine. Soon enough I am in Ilanz, from where I start a new Swiss Mobility trail. My sister and her husband warned me: The Val Lumnezia is not super attractive to hike. They are right but at the same time it is a kind of new valley for me and I thought for 25 km it should be bearable. Soon I am happy however, that I wear my Hoka shoes with max cushion. Miles on asphalt. The path is not even that unattractive. As everywhere else the people are not satisfied with the beauty of their nature. They have an esoteric power-places-path who leads you along some allegedly powerful places. I am sure, this path markers attract thousands of tourists per year, as the information on these signs is pure BS. As soon as something is sponsored everybody smells big business. 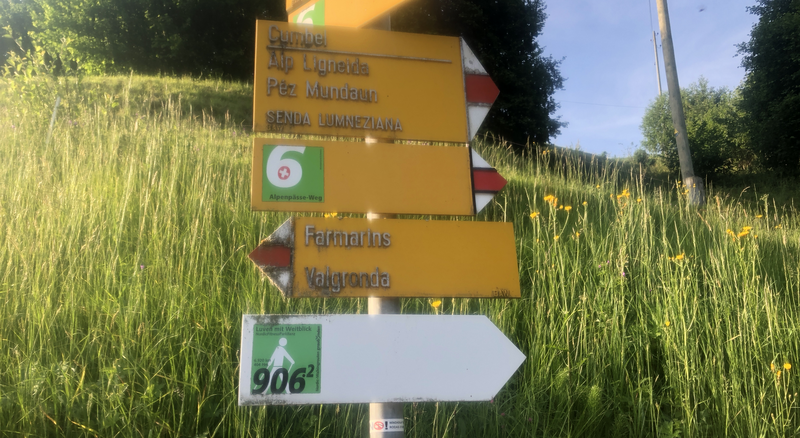 The official yellow path markers are old and around Ilanz they point in wrong directions. Nobody seems to care. This trail was opened in 2008 and I believe since back than nobody has ever checked on the signs. Of course, Switzerland Mobility leads you again through villages. Ilanz in the background, Luven in the foreground. The hike from Ilanz to the end of the valley takes me 5.5 hours. The internet says it will take you 9 hours. I didn’t roll fast but they also claim that it is a mountain path. It’s true, a mountain path made out of concrete most of the times. I can’t wait to leave the asphalt and become a little more adventurous. It’s just a connection, right? One half of the valley. Ilanz is behind the hill on the left side. There is just a little snow. The first snowfields are solid, and I can cross them with a little help from my crampons. They get stepper however and the snow gets soapy. At some point the crampons provide no additional stability. If you slide on this terrain you will find yourself potentially sliding for hundreds of meters. Thank you but no thanks. I turn back to Vrin where I take public transport back to Zurich. The Greina plateau is a site of national importance. For decades the state tried to use the water for hydropower. In 1986 environmentalists won a battle and the authorities gave up on the project. There was another project recently: The founding of a national park like Yellowstone. The citizens voted no. Although the poll was held in 2016 there are still signs and posters visible. One of the opponents of this park has helped to stop the hydro plant in the Greina back in 1986. Today he is a populist and he tries to advance the agenda of so called mountain people by constructing differences between people in the cities and the mountains. Of course, he wants more tourism in the villages and more traffic infrastructure. And he has obviously forgotten who pays the bill at the end of the day. Without money from the central Swiss government his valleys would be empty since a century. And the money the Government spends is earned by the economic centers in flatter parts of Switzerland. All farmers together (not only those in the mountains) earn 1 % of the GDP of Switzerland. They get supported from the central government with 7 billion francs per year.